Using a modeling technique, researchers found a unique way that the communication molecules of certain bacteria, similar to what causes E. coli, enter the membrane of other bacteria. 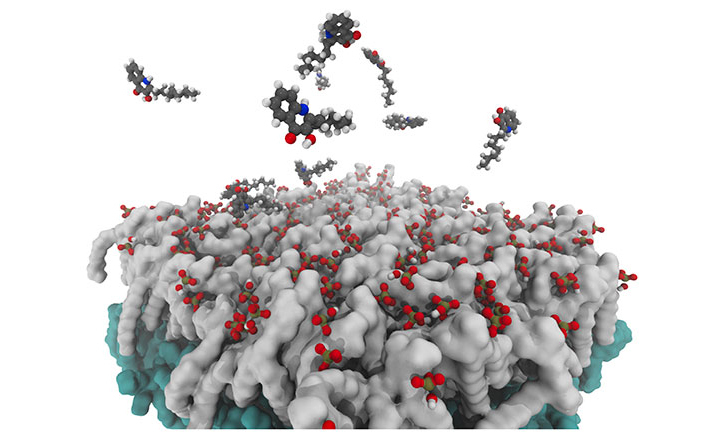 Small communication molecules interacting with the membrane of the bacterial cell. Researchers at Binghamton University have uncovered the unique way in which a type of Gram-negative bacterium delivers the toxins that make us sick. Understanding this mechanism may help design better ways to block and eventually control those toxins. Assistant Professor Xin Yong and graduate student Ao Li from the Department of Mechanical Engineering along with Associate Professor Jeffrey W. Schertzer from the Department of Biological Sciences published their findings in the Journal of Biological Chemistry. Schertzer and Yong explained that the communication molecule has both a head and a tail that are known to be flexible but they did not expect this type of change. In the future, they hope to test what would change in the interaction when the tail is removed or the head is modified. While the study may sound fairly specific, it has some wider implication for all Gram-negative bacteria. The study titled “Molecular conformation affects the interaction of the Pseudomonas quinolone signal with the bacterial outer membrane” was published online by the Journal of Biological Chemistry on Jan. 25, 2019 and was funded by the National Institutes of Health under grant number R21AI121848.